Darlington breathtakingly came back from 2-1 down with 12 minutes left to win 3-2 in a nerve-shattering game at Heritage Park. There were so many shredded nerves at the end, that it was no wonder manager Martin Gray ran 50 yards to salute the Tin Shed on the final whistle. It was the sort of night that had Darlo fans sighing heavily with relief at the end. The two subs, David Dowson and Liam Hatch. 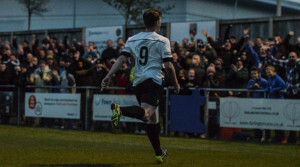 But it could have been so different if Moors’ Kallum Griffiths had scored with a magnificent 45 yard effort at 2-2. 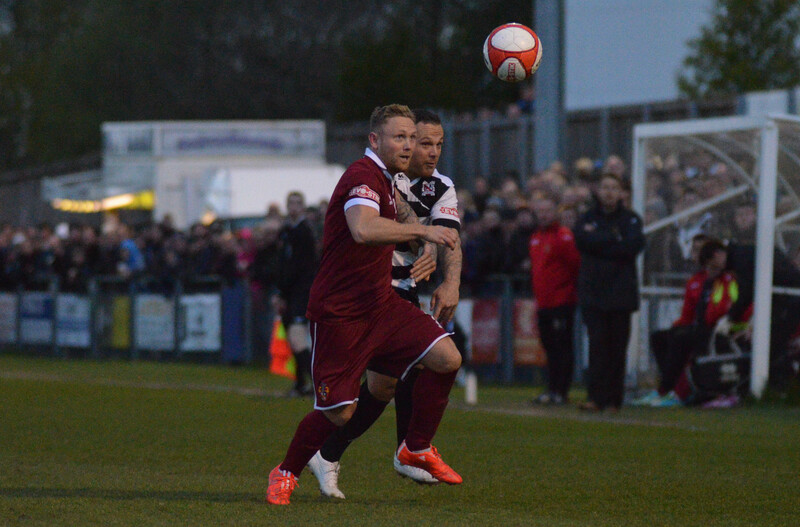 Quakers will now play Bamber Bridge at Heritage Park on Saturday. 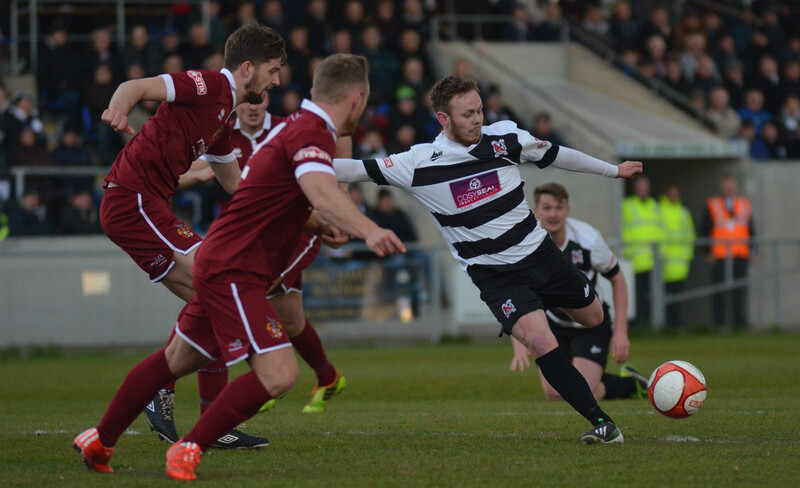 Quakers had the wind at their backs in the first half, but it was Moors who had the first chance when Shane Henry got round the back of the Darlo defence and pulled the ball back into the middle, but Alan White got the ball away. Quakers created their first real chance on 11 minutes when Gary Brown ran down the right and crossed the ball low into the six yard box, where Graeme Armstrong could only scuff his shot wide. There was another chance on 19 minutes when Nathan Cartman picked up the ball on the edge of the box, turned quickly, and hit a left foot shot just over. Moors keeper Gareth Young was called into action on 22 minutes, holding a header by Armstrong off a deep free kick by Terry Galbraith. After Leon Scott was booked for a late challenge on Lewis Dodds, Moors nearly took the lead on 27 minutes when Stephenson won the ball in the Darlo area, sidestepped a challenge and smashed a right foot shot against the bar. And there was another let off for Quakers when Gavin Cogdon charged down an Alan White clearance and set up Nathan Fisher, who pulled his left foot shot narrowly wide from the edge of the box. But Quakers had a chance at the other end when Tom Portas headed the ball forward for Nathan Cartman, who mishit his shot wide from the edge of the box. They broke through just on the half time whistle. Gary Brown burst down the right and delivered a perfect cross into the middle for Armstrong to rise above his marker and majestically head into the bottom corner. There was a half chance at the start of the second half when Armstrong won the ball on the half way line, ran forward to the edge of the penalty area and hit a swerving left foot shot wide. But Spennymoor looked dangerous on the break, and Fisher nearly equalised when he chased the ball into the box and hit a first time shot just inches over the top. Moors then forced three corners in as many minutes, and they scored off the third. There was a scramble in the Darlo box in which Jameson pulled off a point blank save from Liam Henderson, but former Darlo player Joe Tait was there to force the ball home. On 65 minutes, Moors nearly went in front when Henderson got through 1 on 1, but Jameson blocked well. And Moors took the lead on 76 minutes when sub Michael Roberts turned well inside the Darlo box, and hit a looping right foot shot over the stranded Jameson. At that point, Moors looked to set to go and win. But Quakers got back into the game straight away. Liam Hatch came on as sub on 78 minutes, and scored with his first touch, heading a Galbraith corner from the right into the bottom corner of the net. Moors nearly went back in front with a magnificent effort by Kallum Griffiths, who flicked the ball over Mitchell, and hit a dipping volley from 40 yards that beat Jameson all ends up, but fortunately for Quakers, cannoned back off the bar. The fans could hardly draw breath, nobody could tell which way the game would go. But then came a most dramatic late winner, one which will Darlo fans will remember for a very long time. With just a single minute of normal time left, Armstrong made a good 40 yard run up the left to the bye line, stopped, turned and pulled the ball back perfectly for David Dowson to squeeze the ball in at the near post past the stranded Young. There were jubilant cheers of delight and audible sighs of relief when the goal went in, even more so when the final whistle went after four nervous minutes of stoppage time. Even MG displayed his feelings, and ran 50 yards to slide in front of the Tin Shed. The job is only half done, but at least Quakers have gone further than last season when they lost to Ramsbottom.